Once you try cooking chicken breasts in a smoker, you’ll never want to eat chicken any other way. Serve your smoked chicken with glazed carrots and baked potato wedges for a complete meal. I’ve been smoking a lot of different meats lately, and I have to say, I think this smoked chicken breast is my favorite! The chicken is full of flavor, super juicy, and is easy to make. I like to make a double batch so that I have plenty of leftovers the next day for sandwiches. How do you make smoked chicken breasts? For the best results, I recommend brining your chicken for a few hours before you smoke it. The brine infuses the chicken with flavor and also keeps it from drying out in the smoker. I use a half batch of my favorite brine recipe. The chicken then gets coated in BBQ rub and goes into the smoker. The finishing touch is a coating of homemade BBQ sauce, then dinner is ready! It takes roughly 60-90 minutes to smoke chicken breasts, depending on the size of the breasts. Smaller breasts (4-6 ounces) will take an hour, while larger breasts (8 ounces or more) will take closer to 90 minutes. The best way to gauge whether your chicken is cooked is to use a thermometer to test the thickest part of the chicken breast. What temperature do you smoke chicken breasts? I smoke my chicken breasts at 250 degrees F. You can also smoke your chicken at 225 degrees F, but you’ll need to adjust the cooking time accordingly. When is chicken breast done? Chicken breast is safe to eat when the internal temperature of the thickest part of the breast registers at least 165 degrees F. I use a probe thermometer to continuously monitor the temperature of my chicken as it cooks, that way I can pull the chicken out of the smoker at the right time without worrying about it getting overcooked. Make sure your chicken breasts are roughly the same size so that they cook evenly and are all done at the same time. In my opinion, homemade BBQ rub and BBQ sauce taste best. If you need to use store bought, that’s also fine too! 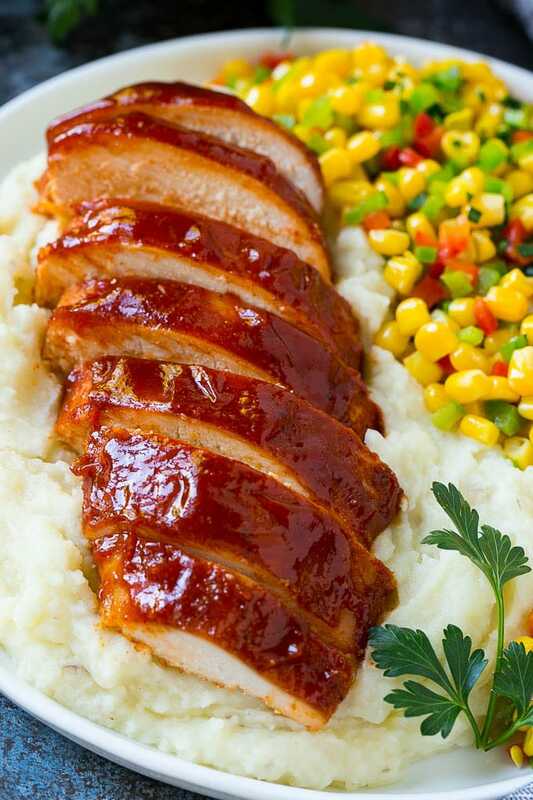 The BBQ rub and BBQ sauce recipes will make more than you need for this particular recipe. The rub will keep in a cool dry place for 6 months, and you can freeze any leftover BBQ sauce. I like to serve my smoked chicken thinly sliced with potatoes and a vegetable. Smoked chicken leftovers reheat well. 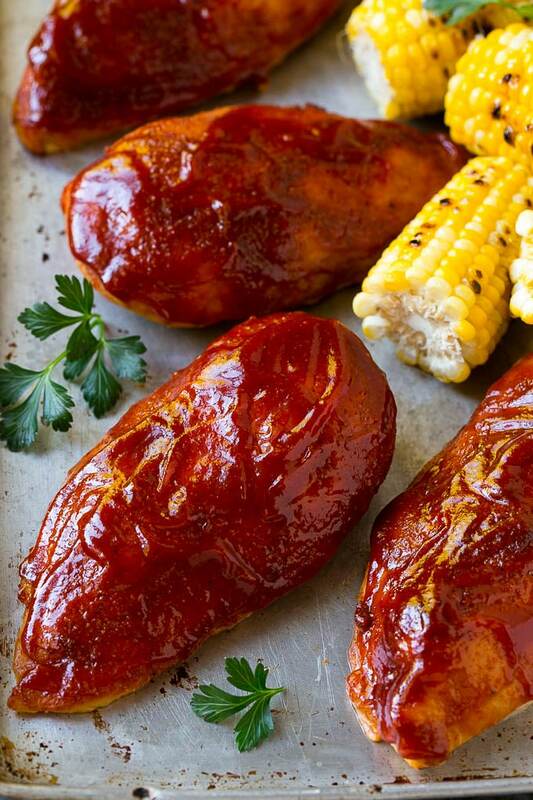 Place whole smoked chicken breasts in a covered baking dish and cook at 325 degrees F until warmed through. I typically use apple wood for smoked chicken, as it imparts a mild, slightly sweet flavor. Other great choices are cherry wood, hickory or maple wood. I served this smoked chicken breast at a family gathering recently and it got rave reviews, there were no leftovers. I love how easy and versatile this recipe is, it’s one of my all time favorite ways to eat chicken. 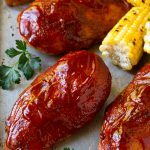 This smoked chicken breast is boneless skinless chicken that's coated in a homemade BBQ seasoning, smoked to tender and juicy perfection, then brushed with BBQ sauce. The best chicken breasts you'll ever eat! Follow the brine recipe as instructed, cutting all the ingredients in half. 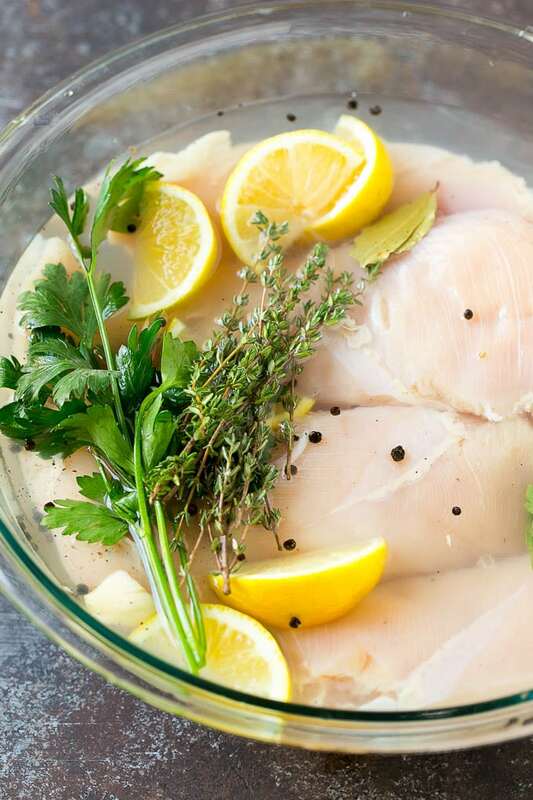 Place your chicken breasts in the bowl of brine, cover and refrigerate for 2 hours. Remove your chicken from the brine. Pat dry. 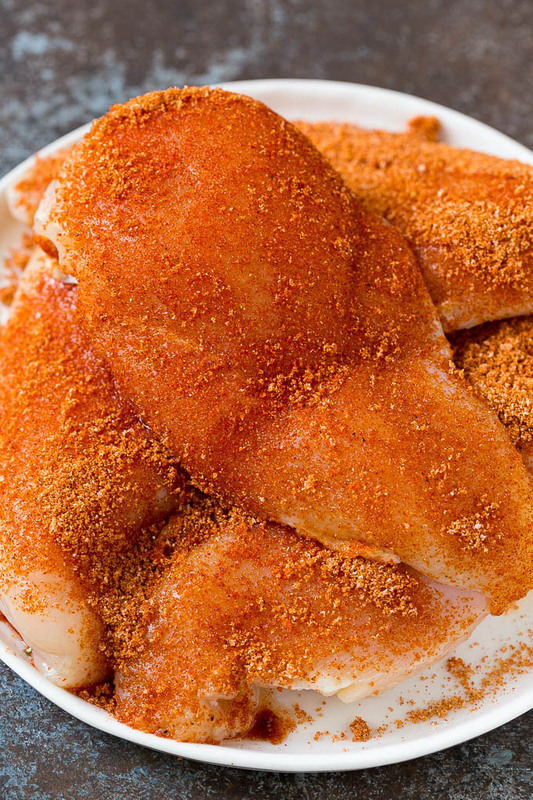 Preheat your smoker to 250 degrees F.
Coat the chicken breasts with the spice rub. Place the chicken in the smoker and cook for 60-90 minutes or until a thermometer inserted into the thickest part of the breast registers 165 degrees F.
Brush the chicken breasts with the BBQ sauce then smoke for an additional 10 minutes. Let the chicken sit for 5 minutes. Slice and serve with any remaining BBQ sauce. YUM!!! This is the best smoked chicken ever!!! My family loved it! SO much flavor! Love that homemade BBQ sauce! It doesn’t get better than this for weeknight dinners! Looks great! Your recipe looks mouthwatering! Everyone will enjoy this, I can’t wait to serve this delicious dish! WOW! These chicken breasts were GREAT! Definitely a keeper recipe. Thanks !!! Such a hit at dinner time! A great meal! 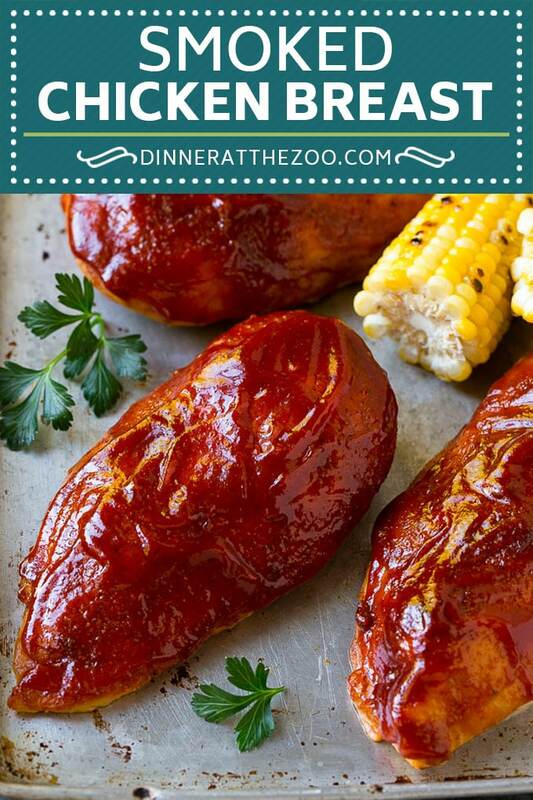 These look so tender and juicy! Can’t wait to make these for dinner! My Hubby is going to love this chicken! It looks amazing! Tastes like summer! Can’t wait to break out the smoker again. My husband loved it! Taste really good! We actually have a smoker, but I’ve never actually smoked chicken breasts. They look so good, that now I’m excited to try it! Thanks for sharing. Smokey chicken is the best! 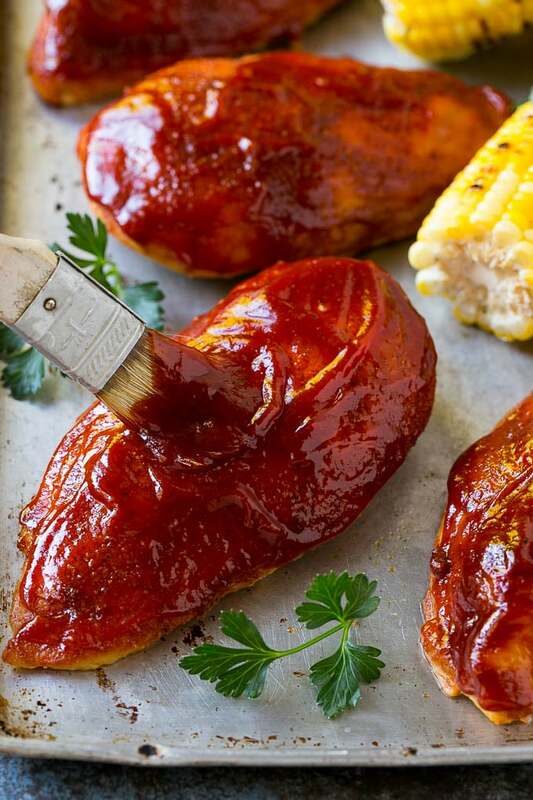 We love making our own homemade BBQ sauce too – so much flavour.